March 22 is National Bavarian Crepes Day. Bavarian crepes are not the same as pancakes, that is why they have their own holiday. Crepes from Bavaria are called a palatschinke. They are similar to French crepes but have certain difference in usage of batter. Batter for French crepes has to rest before it is used, and batter for Bavarian crepes is used right after it's made. 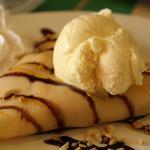 Bavarian crepes are typically sweet, although there are lots of savory versions. Bavarian crepes can be served with and without any kind of filling. If you like crepes without filling, then make their taste better with adding some Bavarian cream atop. Bavarian cream is a usual pastry cream that is thickened with gelatin rather than cornstarch. Lighten cream with whipped cream just before it sets up. You can also try Bavarian crepes served with fruit and chocolate sauce atop. We're sure you won't be able to help trying this simple delight. Start baking Bavarian crepes to celebrate National Bavarian Crepes Day with your family!